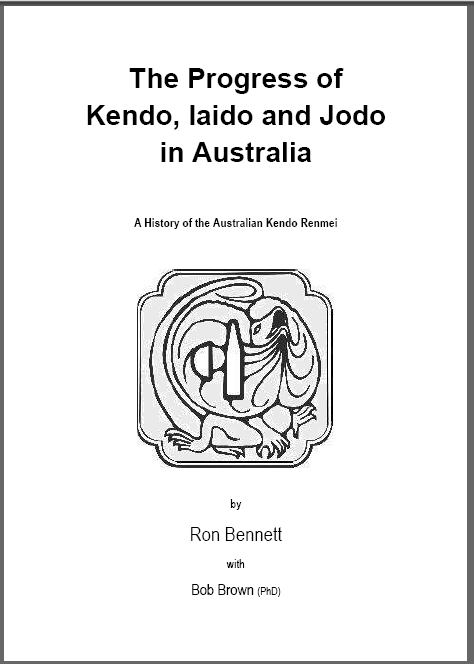 At last, the AKR History, “The Progress of Kendo, Iaido and Jodo in Australia” is available in PDF form. This project was commenced years ago by the late Ron Bennett, a founding member, a multi-term President of the AKR and the first kendo sensei to many, now quite senior, kendoka. Ron’s vision was to make this work available to all those who were interested. Contributions were received from many, many members. Thanks go to Gary Oliver of Victoria, who also wrote and compiled local history, much of which is included in this publication; to Dr. Bob Brown of Wollongong, who over a few years, assisted Ron with writing and digitising words and photographs and Katie Marx of Victoria, conducted a final corrective edit for spelling and names. Thank you Ron, Bob, Gary and Katie. The AKR provided funds to Ron to offset the costs of his many phone calls, travel and visits to conduct interviews, petrol for Bob to travel from Wollongong in southern New South Wales to Ron’s home at Rainbow Flat in northern New South Wales and many other costs that were incurred along the way. We think the investment was worth every cent. This book is now available to download as a PDF file. Your copy will be personalised and licensed to you and you should be able to read it on any computer and most ebook platforms. The price of $10.00 will be revenue that the AKR will use to support the activities and development of our members activities to develop their skills in kendo, iaido and jodo. Secure payment may be made via Paypal from your Paypal or credit card account. The AKR does not have access to your account information. Shortly after your payment is made, you should receive an email sent to the address that Paypal has registered to your account. with a secure link to download your personalised copy. The link will expire after 24 hours and allows for one download. The email address that is registered to you at Paypal maybe different, so please check that address as well. Gmail users, please check your spam folder and / or your settings.